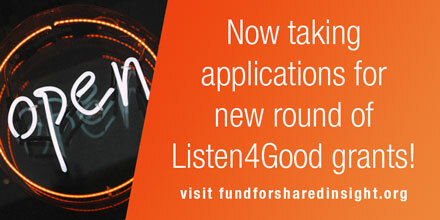 Fund for Shared Insight is once again accepting applications for Listen4Good (L4G). This L4G grant round will be the last to provide matching funds and require nominating co-funders. During the past two years, L4G has supported nearly 160 customer-facing nonprofits — across issue areas, communities, and budget sizes — as they build the practice of high-quality feedback loops with those they serve. L4G’s survey methodology offers a simple, yet systematic and rigorous way to listen to, and respond to, the people at the heart of our work. To engage more funders in supporting feedback efforts and thinking about how feedback data might inform their own work, these grants have been structured as a co-funding opportunity, and we are offering this opportunity one last time. To participate in L4G, a nonprofit must be nominated by a current funder (existing or new). Nominating funders will contribute $15,000 to Fund for Shared Insight for each nonprofit selected to participate. Grantees will receive $30,000 for an 18-month grant period. Grant applications are due by June 29, 2018, at 11:59 p.m. Pacific time. Funders: to learn more about how to nominate a grantee, please click here. Nonprofits: to learn more about how to apply for a grant, please click here. Please stay tuned for our plans later this year to introduce a new L4G grant opportunity and program model that will allow even more organizations to use the L4G survey, tools, and benchmarks. To learn more about how organizations participating in L4G are using feedback to improve programs and build a stronger culture around listening, watch this new video, featuring SRVS, a Tennessee nonprofit that works with people with disabilities.